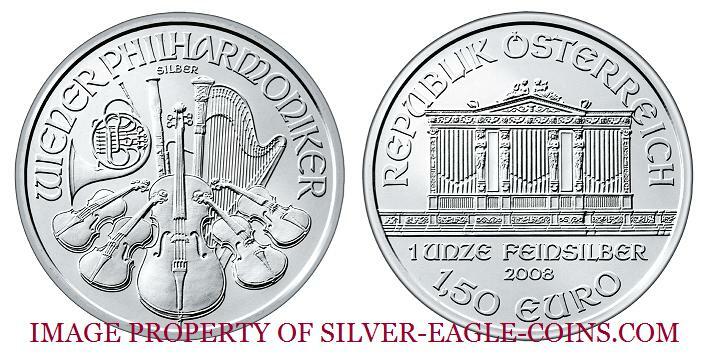 This gorgeous coin is the "First-Year-of-Issue" Austrian One Ounce Uncirculated Silver Vienna Philharmonic. Following the success of their incredibly popular Vienna Philharmonic gold bullion coins, the Austrian Mint introduced a silver bullion version of the same design in 2008. One side of the coin features selected instruments of the world famous orchestra while the other side of the coin depicts the great organ of the Golden Hall in Vienna, site of the annual New Year's Day Concert. As a "first-year-of-issue" coin release, the 2008 Silver Philharmonic may become the "key" to the series (which is typical of first-year-of-issue bullion coins). The coin is gem brilliant uncirculated with a gorgeous "proof-like" finish and is 37 mm in diameter. The coin contains one ounce 0.999 fine silver, with a â‚¬1.50 face value -- making it a "legal tender" coin in Austria. Obviously, the face value is largely symbolic since the intrinsic silver value is much greater than the face value.